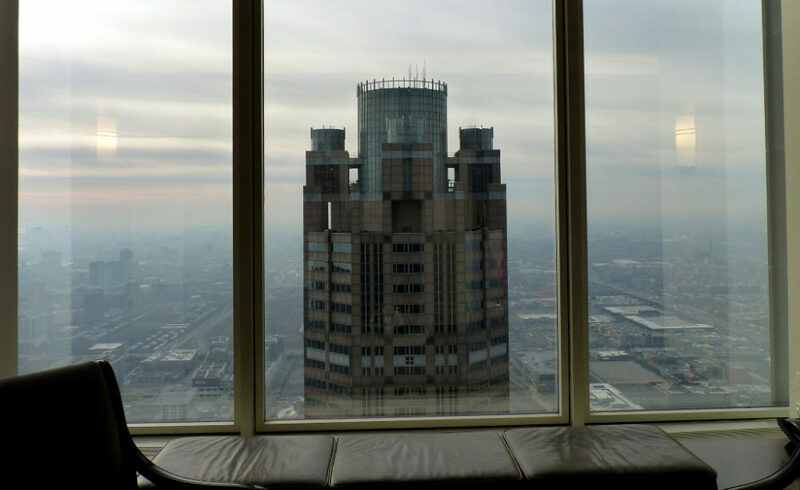 311 S. Wacker in Chicago, as seen from the 66th floor of nearby Willis Tower. When commercial real-estate firm Zeller Realty Group bought a postmodern staple of Chicago’s iconic skyline in 2014, it faced an energy-inefficiency quagmire. Like many buildings built prior to the late 1990s, 311 S. Wacker’s heating and air conditioning systems were controlled by pre-digital, mechanically operated pneumatic thermostats, which collected no data and could not be centrally controlled. The usual, pricey solution would be to rip out all the old analog HVAC infrastructure and replace it with direct, digital equipment. Instead, Zeller embarked on what it calls the “smartest energy efficiency retrofit in Chicago.” It largely kept the analog HVAC system but swapped in wireless pneumatic thermostats that effectively add a layer of “smart” connectivity on top of what otherwise would be a “dumb” system. This enabled Zeller to adopt an advanced building-operations monitoring and control system that can make more targeted, real-time adjustments in energy consumption. The company also replaced inefficient common-area lighting with more efficient fluorescent lamps and LED lights. The whole project cost Zeller under $900,000 – far below the millions it might cost to do a complete retrofit – and took roughly six weeks to complete. Local utility ComEd kicked in around $400,000 as part of its Smart Ideas energy-efficiency program, cutting the cost of the project nearly in half. Taking into account the rebate, the project paid for itself in less than two years, according to Zeller, and the 1.4-million-square-foot office building now achieves more than 30 percent in HVAC energy savings each year. In 2015, commercial and residential buildings made up 40 percent of total U.S. energy consumption, according to the U.S. Energy Information Administration. In Chicago, city legislators passed a 2013 ordinance that calls on commercial, institutional, and residential buildings larger than 50,000 square feet to track and report whole-building energy use, with the hope that it will challenge building owners to cut their energy and emissions footprints. In January, the city released a report showing that between 2014 and 2015, buildings in compliance with the ordinance reduced their weather-adjusted energy use by 1.9 percent for a cost savings of $6.2 million per year. The problem with the existing pneumatic thermostats in 311 S. Wacker and other buildings like it, is that they rely entirely on mechanical compressed air action to operate, says Harry Sim, CEO of San Jose, California-based Cypress Envirosystems, which provided the new wireless pneumatic thermostats for the building. When air pressure drops, a heating valve in the old thermostats opens to introduce warm air. When the pressure rises above a certain point, the valve closes again. The limits are set at the thermostat, and there’s no way to control it remotely or get any kind of data back about potential glitches in the system. Wireless thermostats help manage older HVAC equipment at 311 S. Wacker. “All the things we take for granted in modern, smart buildings – fault detection, optimization, the smart grid, sensor networks – none of that is possible with these pneumatic thermostats because they’re all mechanical compressed air,” says Sim, who estimates that roughly 70 to 80 percent of buildings in downtown Chicago have these kinds of pneumatic controls. It’s why Cypress developed a wireless pneumatic thermostat, which provides a level of connectivity and communication without having to rip open walls and replace legacy mechanical equipment. The product is essentially a traditional pneumatic thermostat but with the addition of a pressure sensor, a temperature sensor and an antenna that can transmit sensor information and receive commands from a centralized control system. It also includes an internal motor that acts as a “virtual thumb,” adjusting the temperature from afar when it is necessary. “It’s essentially putting a lot of smart things on top of a dumb thermostat – and adding an antenna,” Sim says. With the thermostats now collecting significant amounts of data, Zeller needed a system for managing, analyzing and acting upon the newfound information. For that, they adopted IntelliCommand, a smart-building monitoring system developed by JLL, a Chicago-based real-estate services firm. Connected buildings can raise concerns about security and reliability, but Gattuso says he’s blessed with an IT group that was able to develop a secure network on which to run these new, smart technologies. What’s more, because the wireless pneumatic thermostats can fundamentally still operate based on the physics of mechanical compressed air, Sim says the thermostats would continue to provide basic temperature-regulating functionality even if the batteries and electronics all fail. Sim founded Cypress after working for years on building systems at Honeywell, which design and builds technologies for a wide range of industries. Before Honeywell, Sim was a payload director at NASA’s Mission Control Center in Houston for Space Shuttle mission STS-40. While managing a building’s systems might not be on the same scale as keeping a 250,000-pound spacelab in orbit for nine days, Sim says the two have some elements in common.